Rain chances will be almost nonexistent allowing thermometers to bubble back up in a big way. A strong ridge of high pressure will result in the hottest air so far this year gripping the Gulf Coast into early next week. A *HEAT ADVISORY* will go into effect for the entire WBRZ Weather forecast area from 11am – 8pm Friday. Expect this to be reissued each day through the weekend. A HEAT ADVISORY means feels like temperatures could exceed 108 degrees for several hours. Prolonged outdoor activities could lead to heat related illness if precautions are not taken. Drink plenty of fluids, stay in an air-conditioned room when possible, avoid long durations in the sun and check up on relatives and neighbors—especially those that may not have access to air conditioning. Take extra precautions if you work or spend time outside. When possible, reschedule strenuous activities to early morning or evening. 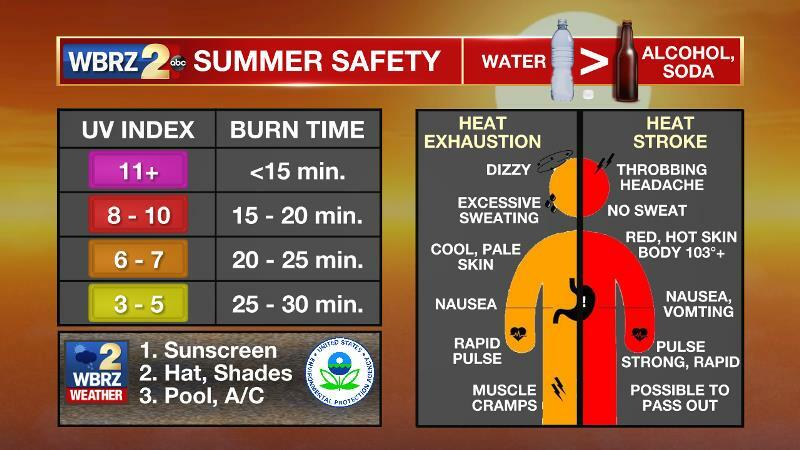 Know the signs and symptoms of heat exhaustion and heat stroke. Wear light, loose fitting clothing when possible and drink plenty of water. Look before you lock; check the back seat of vehicles for kids and pets and remember that Fido’s paws would prefer a morning or evening walk instead of the afternoon! Today and Tonight: A long stretch of oppressive heat will begin on Friday. Beneath partly sunny skies, temperatures will warm into the 90s by noon. 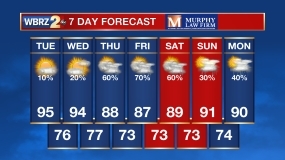 A high temperature near 96 degrees is expected and elevated humidity will produce a feels-like temperature at or above 105 degrees for several hours. Little relief will come overnight as lows struggle to leave the 80s. Up Next: Nasty heat will continue through at least Monday. Heat related illness will is a threat if proper precautions are not taken. Thanks to very high dew point temperatures, (humidity) feels-like temperatures will be between 105 and 110 degrees for several hours each afternoon. Nighttime lows will struggle to leave the 80s. 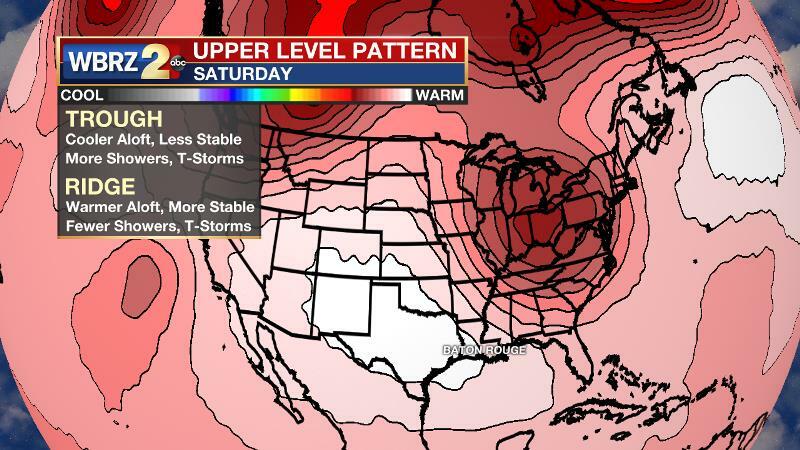 There are signs that the nastiness will begin to break Tuesday or Wednesday next week. 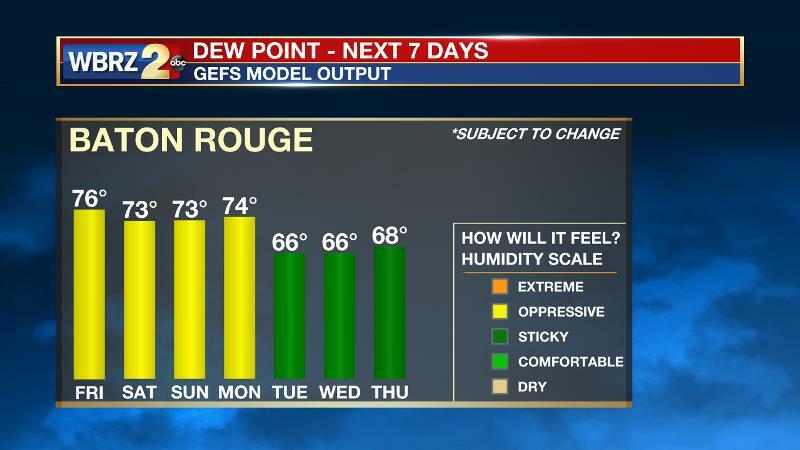 Not only will the heat ease off, but also a weak cold front may noticeably reduce humidity. Of course, a front would also be accompanied by some showers and thunderstorms—possibly strong. A 500mb ridge will continue to gain ground eastward across the central Gulf Coast over the next several days. Convection will significantly decrease on Thursday before rain chances go to almost nil on Friday. As more hours are spent beneath sunny skies, surface temperatures will warm into the mid to upper 90s and stay there for many hours. High summer dew point temperatures will have a twofold effect; the first of which is afternoon feels like temperatures approaching 110 degrees and the second of which is nighttime lows struggling to leave the 80s. The core of the upper level high pressure will park over eastern Texas by Sunday leading to considerable subsidence and compressional warming. Air temperatures could flirt with 100 degrees in some locations. The hot pattern will continue into early next week. Thereafter, forecast models agree on an upper level trough pinching off along the East Coast and retrograding southwestward toward the Gulf Coast. This scenario playing out should at least put an end to the oppressive heat if not return higher rain chances as well. Models show some decent mid-level spin associated with the trough, which would generate the lift needed to overcome any subsidence in place on the eastern flank of the ridge. It is worth noting though that the western side of a trough, where our areas will be, tends to be the quieter side.